In 1973, Dr. Walter C. McCrone declared the Vinland Map to be a fake. The Vinland Map depicting the world as it was thought to be in 1440 but showing Vinland (Northeast North America) in the upper left. Alphanumeric labels indicate the 27 McCrone micro-sample ink locations. 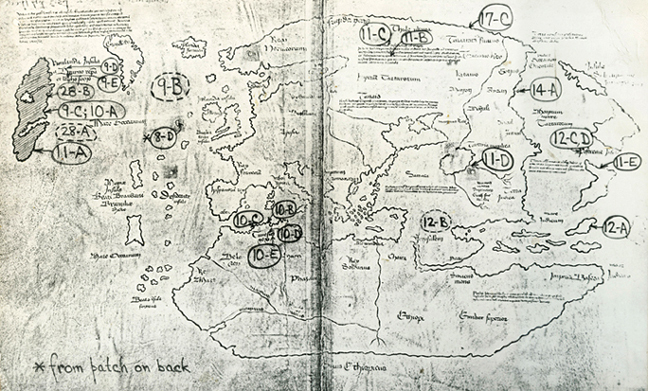 Update: Read Dr. McCrone’s Vinland Map 1999 article published in The Microscope journal. The Vinland Map (VM) was first revealed to the world in 1965 with the appearance of a book, The Vinland Map and the Tartar Relation, by Skelton, Marston, and Painter. The map, an unassuming pen and ink rending, is a world map on 27.8 x 40 cm parchment folded in two leaves. It is, however, remarkable for its purported date of 1440 in depicting lands to the west of Greenland, their shape, size, and position resembling the Northeastern extensions of North America (i.e. Vinland). The perpetrator had simulated a yellow stain along the black ink lines because black lines would develop such a stain as the ink migrated along the fibers (a micron or so every 100 years) and become yellow with age. Not having 500 years to wait, he executed the map entirely with a yellow ink line then very skillfully added a black ink line down the middle of the yellow line. Then, to compound the felony, he used a yellow pigment, titanium “white,” that in the 1920s, when it was first produced as a very finely divided ink pigment, was yellow from iron impurities. That pigment, TiO2, was the newly invented (1917 patent) pigment averaging 0.3 micrometers in diameter and produced by a process of dissolving ilmenite, iron titanate (FeTiO3) in concentrated sulfuric acid, hydrolyzing this to an amorphous gel and then calcining it to 0.3 micrometers anatase crystals at up to 800 degrees Celcius. An unlikely procedure for a medieval ink maker who wanted a black ink. Tom Cahill et al. of University of California (Davis) in 1987 using submillimeter samples and a trace analysis instrument (PIXE, a proton probe) found more titanium (PIXE identifies only elements, not compounds), in the Vinland Map ink lines than elsewhere on the parchment. He says “too little titanium” to explain the yellow color of the yellow ink. His sample is a large fraction of a cubic millimeter and he expresses his results as ng/cm2. McCrone measured the titanium content of nanogram flakes of the yellow ink itself, no parchment, and found 5% – 45% by weight of the inorganic content to be titanium. McCrone had no trouble detecting TiO2 as 0.3 micrometer anatase by PLM and XRD. McCrone also detected plenty of titanium in 21 different samples of the yellow ink using electron and ion microprobes. In short, there is no possibility the VM could be medieval — yet on February 10, 1996, a symposium [to which Dr. McCrone was not invited] was held at the Yale University Press to celebrate release of the second edition of “The Vinland Map” published by Yale University Press and authored by R.A. Skelton, T.E. Marston, and G.D. Painter. Those invited were avowed believers in the authenticity of the map. “How then did we find 200 times more titanium in the VM than in the other two texts and how were we able to obtain an X-ray diffraction (XRD) pattern characteristic of anatase and transmission electron micrographs of areas of the VM yellow ink showing 100 or more anatase particles? We did it by using ultramicroanalysis [submicrometer particles]. These particles are unique and impossible to have been prepared in 1440, 300 years before titanium was discovered and nearly 500 years before the chemical synthesis of pigment titanium dioxide was developed and, with great effort and expense, perfected to yield 0.3 micrometer anatase pigment. The situation with the VM now becomes the same as with the Turin “Shroud,” another widely known and important relic that unfortunately I and my colleagues also found in the 1970s to be a fake Read about Dr. McCrone’s work on the Shroud of Turin. There [on the Shroud] we found, by identifying single submicrometer particles as the only colored matter in the “Shroud” image areas, two red pigments and a yellowed watercolor paint medium. The pigments red ochre and vermilion with the collagen tempera medium was a common paint composition during the 14th century; before which, no one had ever heard of the Shroud. The Bishop of the diocese of the Church where it was first exhibited in 1356 wrote to the Pope saying he knew the artist who had painted it. We decided, based on our particle approach in 1979, that the Shroud was painted in 1355. In 1987, eight years later, carbon dating at three prestigious laboratories confirmed this by agreeing on a best date of 1325, plus or minus 65 years. Up to now I’ve been able to maintain my equilibrium and even my sense of humor in the face of being ignored or being insulted-one postcard stated “Old man Walter C. McCrone is an incompetent senile old fart who belongs in the nuthouse. That old fraud fudges data on an unprecedented scale [signed] Citizens for Scientific Honesty.” I laughed when I was told the image was a result of the resurrection and even when Prof. Bollone typed my red ochre paint and found it to be type AB. My most recent laugh came when John Jackson and his wife suggested the 14 × 3 ft. Shroud linen was the tablecloth at the last supper. Lately and especially after the recent Yale Symposium, I find it more difficult to see the humor in these situations. From a scientific point-of-view, these two problems were not difficult to solve, especially if one uses PLM and other ultramicro techniques and instruments on tiny particle samples rather than trace analysis techniques on millimeter samples like PIXE, Cahill’s instrument. No one other than McCrone working on these two fakes used light and electron microscopes. Instead, others looked for traces using good but inadequate and inappropriate trace analysis techniques. These are not intended for problems like VM or the Shroud. I had hoped solving these problems using PLM then using other proper ultramicroanalytical instrumentation for confirmation would help PLM recover its lost position in analytical chemistry. PLM has been cheated out of this recovery and is rapidly sliding into oblivion. This situation is now no longer funny, and I am looking for ways to redress this wrong. It seems to me to be a matter for the attention of the American Academy of Sciences. Read Dr. McCrone’s Vinland Map 1999 article published in The Microscope journal.